A part of technological design I think is important, is the distribution model chosen. In a dominantly capitalist economic system, marketability seams to be a deciding factor in the success of an idea or even whether anyone bothers building something in the first place. I won’t speak too much on the failures of capitalism, it speaks for itself. There are some links to various Marxist criticisms on my link page if you are interested as well as capitalist alternative strategies. Profitability is not my goal, instead, a genuine desire to explore interesting concepts and apply what I learn to help people help themselves is motivation enough for me. I would like to live in a society where by citizens exploring and investing themselves in what they are passionate about, the social progress resulting would benefit each of us in a way that would make our civilization durable, adaptive and peaceful. Violence and ignorance stem mostly from economic and social inequality. In my mind, even within the framework of what is likely the most socially unjust time in human history, now is as good as any time to share ideas that can empower people to do what they love and so empower others. Intelectual Property is a nasty subject and how society approaches copyright and patents is changing, but not a fast as it should. The historical conception of both of these concepts is understandable, but I’m afraid the conditions that sought their creation have changed considerably. I, myself, do not own any copyrights or patents on anything. I am not entirely opposed to the concepts, however they have both been used to control people and to restrict life changing ideas and technologies. I don’t foresee ever copyrighting anything and I am not by any definition a computer programmer, but I am inexorably enthralled by the words and philosophy of Richard Stallman the creator of The Free Software Foundation and Copyleft. Stallman explains it quite well so if you want an in depth discussion, click on the links above or look for a video interview. Free software, as far as I can tell, represents a philosophy advocating personal freedom and respects a software user’s right to have access to the source code of a program and be free to alter as they wish and then grant other users of that modified version the same freedoms granted to them. This is a far cry from the the practice of proprietary software producers that restrict the freedom of the end user by withholding the source code, spying on their activity, restricting access to content and forcing mandatory software updates on them. There is yet another group of software producers generally called “Open Source“. This is a popular term that has gotten mucked up with the free software people, but can be something quite different. Stallman and perhaps others have said, “Open source is a development methodology; free software is a social movement.” Open source can offer the same freedoms as free software does, but not always. Open source is a model more likely to be embraced by the business community because of the advantages afforded by letting users collaborate on software improvements, but then being restrictive on distribution and who can benefit from any improvements. So the term “Open Source” has become tainted by unethical business practices that sometimes seek control rather than freedom. Of course as I write this on my (used) MacBook running proprietary software with a window in the background containing my Facebook newsfeed, I see the hypocrisy of advocating free software. I’m an American; of course I’m a hypocrite! 🙂 I use these programs with knowledge of their parent company’s unethical business practices out of shear laziness and convenience. I will make the transition in time to free software platforms, but for now what I am advocating is a philosophy of freedom; an ideal. How can we advance the same freedoms advocated by Richard Stallman and everyone in the free software movement to to physical technology? Obviously there are some undeniable differences between a software program and a piece of physical technology such as a refrigerator. A computer program can be altered, copied and distributed with very few resources while something like a refrigerator requires a lot of physical resources, energy to manufacture as well as the tools and skills that facilitate it’s assembly, not to mention the transportation considerations in getting it where it’s needed. But, before a refrigerator can be built, there must be a design. Therein lies my interest. Patents. Patent, that is what you do right? You have a good idea for a widget of some sort and you want to protect your idea so you patent it. That is what I always thought. I really do not have any interest in the whole mess of it. Patents are extremely expensive and complicated to get and just because you have a patent on a particular technology, doesn’t mean you can stop a powerful company with lots of high price lawyers from violating said patent or finding ways to change just enough in order to claim originality. So even if you do patent a really good idea, you probably have a long and soul sucking road to ever making any money from it. It depends on your motivation behind the idea in the first place. Myself; I would certainly like to make a living by creating new and useful devices, but by controlling an idea and restricting it’s distribution through licensing and royalties just sounds awful. If I really want to see adoption of my idea and not the cheapened, adulterated version produced by market capitalism, then I would be better to find a different model to adopt. Capitalism got us into the ecological and social mess we are in. It seems that more capitalism is not the answer to our problems. In some ways I would like to be able to patent an idea, hoping it could be enforced, and with that patent would be attached licenses similar to GPL giving those interested the right to copy or change the idea, but guaranteeing certain core principles of the design would not be infringed upon under penalty of law. This is neither practical nor realistic and leaves too many things up for debate. Granting a patent holder certain kinds of control over their idea for a time period is not the only argument for why we have patents at all. I’ve heard it said that patents were thought to advance technology not because of monetary incentive associated with royalties, but because patents are required to divulge the operating principles of a particular design which enables other to conceive yet more technological innovation through these explanations. I can relate to this. I have had many late nights researching Google Patents looking for inspiration to solve a problem. So you know what? Screw it! I have some ideas that I think are pretty good. Are they groundbreaking? Not really. Are they genuinely new? Not exactly, but they come with philosophical baggage advocating appropriate technology. I have no idea if anyone might find them interesting or useful, but I think it’s more important to share and to collaborate with others to advance technologies that a capitalist system could not do sustainably. By sustainably I mean capitalism would implode upon itself. Instead of just sharing technologies by design and description, we should share experiences, data collected, future plans and instructions on how to manufacture the thing. I wouldn’t know how to restrict industry from trying to capitalize on an idea so, forget about it. The goal in the development of physical hardware to me, is making it accessible and customizable to as many people as possible. If a part an appliance is more technically challenging than the rest, then make the thing modular so people can share and help each other. We are a species of makers and collaborators, every one of us. Here’s a great article written by an inventor on why he doesn’t patent. There are some terms floating around for most of these ideas. One is “Open Source Appropriate Technology“. It’s a very descriptive term I think although the term “open source” kind of rubs me the wrong way. It’s not that “open source” represents a philosophy counter to what I want to advocate, it’s that it doesn’t represent really any kind of philosophy at all. Instead, it just says that we will collaborate and share designs, an inseparable aspect of free software but lacking in a definition protecting freedom. Then again, maybe “appropriate technology” has enough ethically driven gusto to represent the ideals that I so naively believe in. Open source appropriate technology is more descriptive and replacing “Open Source” with something like “Collaborative” doesn’t really get anywhere. Since I intend to make most of my research, pictures, videos, data, drawings and instructions public; why not just call it “Public Domain Appropriate Technology”? Sure, it’s a mouthful and the acronym PDAT leaves something to be desired, but I think it’s plenty descriptive. That is a working title considering I just came up with it as I was writing this paragraph, but it works for now. I guess I can’t claim I coined the term since I found a few hits via a Google search, but no bother; it works for me. ‹ A Philosophy Behind Technological Development. You make me miss the days when Stallman still gave inspiring speeches. At one time they always seemed to center around ideas like community and freedoms. Now they are always all about user privacy, spyware and so on and so on. The man is a genius, no doubt, but I do kind of worry about him sometimes. To be honest, I’ve known very little of him until recently. I am inspired by things like the GNU Manifesto and his determined resistance to compromise on his beliefs. I can see how he would become somewhat bitter considering the state of affairs today. It would be hard to witness big business embrace the “open source” and collaborative design aspects of free software and reject the most important part, the philosophy of liberty. I’m sure there is a large and vibrant free software cam, but faced with the larger population using proprietary software, he must sometimes feel like he’s backpedaling. My feelings on Stallman tend to fluctuate. To be perfectly honest I think his general inflexibility has probably been a little bit hard on the free software movement in some ways. In recent years he has been a little bit more flexible in regards to things such as dual-licensing but he has also come down pretty hard on any Linux distro that provides users with non-free software or libraries of any kind. The trouble is that he is in a position of trying to fit an uncompromising philosophy in to our real life world that exists as one great big gray area. To make just about anything work in this world you need to accept a certain amount of compromise. I suppose he is pretty inflexible, but I figure there are plenty of people out there in that grey area making small to large compromises on their principles to gain exposure, adoption or influence of some kind. I think it’s important that there is someone who refuses to compromise to give the rest of us some perspective. Maybe that one uncompromising fool keeps the ethical ground state from slipping a little further. Just some lofty thoughts. Sorry for the long lag to reply. Stallman is definitely not one for compromise. I’ll agree with that. But, I think it is important to have people pushing for a pure ideology like that. It makes me hopeful for a better world. I identify as a Marxist and my views are often labelled as extreme and uncompromising because they do not fit well with the mainstream political atmosphere today in the United States. I’m fine with that because I see the need to for society to move in a healthier direction of non-exploitative practices and the encouragement of human development so that passions such as software development are fulfilled for personal reasons and not commercial control and restriction. I know very little about the nuts and bolts of software, but I identify with solid ethical values when I see them. 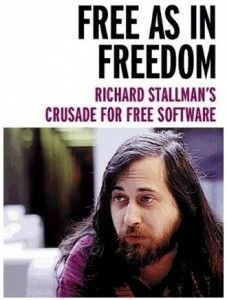 I see that in Richard Stallman.